6 January 2015 by . In our last episode we spoke about a giant of our history: St. John Paul II. We are going to speak about him, but not only tonight. In the eyes of God this important man was welcomed as the one who had to prepare the Church to enter into the third millennium and to begin the third millennium. We will not speak about the chronological events before and during the third millennium. 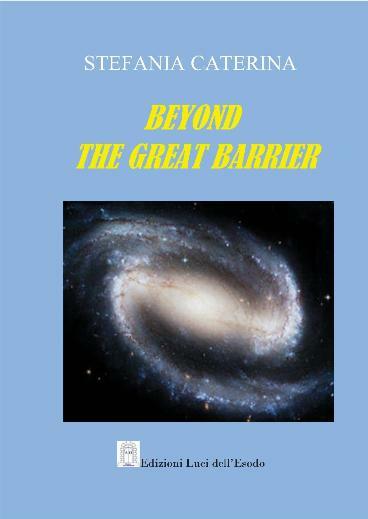 This book tells the events that God has brought about on Earth and in the whole universe. Through Pope John Paul II God gave the Church the grace to move towards the recapitulation in Christ of the whole universe; He opened the way towards the universal Church, and as we will see further on, God will proceed with the new people who are united to His extraordinary instruments as well as the ordinary and the sublime, and He will not stop until He has led the people of God to the recapitulation in Christ and, consequently, into the new creation. Let us listen. The passage is at page 288. The Polish people are particularly dear to God. In fact, God loves all peoples in the universe without preferences because He is the Father of all. However, on Earth, the planet where Jesus incarnated and where the satanic presence is stronger, God has chosen some peoples whom He has entrusted with the mission of keeping the faith, the hope and the love for Jesus Christ alive in this time. They are peoples who are called to be the yeast of Christian holiness not only for the Church but also for entire continents and the whole Earth. They are the beloved peoples of God; however, divine predilection goes always along with faithfulness, purification and responsibility in the response to it. Therefore, these peoples have gone through, great sufferings; great saints came out of them. They are three peoples: the Croatian, the Italian and the Polish people. Today more than ever, as the Christian faith is weakening among many peoples, these three nations are called to live and save the authentic values of Christianity. From the Polish people John Paul II was born, one of the greatest and most loved Popes in history. Much has been written about his life; hence, I will not tell you what you already know but what you do not know. This is the purpose of this story: to show you what human eyes have not seen, but God has read in the hearts of men and between the lines of history. John Paul II was elected towards the end of 1978; not only a year but also an era was ending. In fact, God was about to intervene in order to give your history a decisive turn. Lucifer was raging with the Confederation of the Light that was operating at full power in the low universe. The attacks launched from 1966 on had given results: social unrest, tensions, confusion, immorality and perversion were spreading throughout the Earth. Particularly the seventies witnessed the birth and death of fierce dictatorships; the tension in Europe between East and West exacerbated because of the installation of dangerous missiles on both sides. Lucifer and his fellows planned a third world war in the eighties that would have flared up between the two superpowers, the USA and Soviet Union, and then expand to the rest of the world. In this conflict also the allies of the low universe would have been involved, who would have helped the Illuminati to establish the renowned New World Order. Therefore, besides a disastrous nuclear war with the usual purpose to eliminate useless people, enrich the Illuminati and reshape the geopolitical structure of the Earth, your humanity had to expect an invasion by other humanities of the universe who were certainly not friendly. Moreover, in 1976 Mao TseTung died, the fierce dictator of communist China. Little has been said about him and little is known; he was known as a revolutionary hero and a friend of the people. There is not much to say about him from our point of view: he was one of the many servants of Lucifer and the Illuminati, no different from Hitler, Stalin, Mussolini, etc. Your history is full of such sinister figures as him. Once you know one, you know all of them since evil acts always in the same manner for it is not creative but destructive. The methods change but the purposes are always the same: corrupt, deceive, destroy and command. In this bleak scenery God made a surprise move: the Polish Pope who had known Nazism and communism, a child of a people chosen by God. A Pope who had offered himself totally to Mary Most Holy and who would adopt the motto “Totus Tuus”; a true shepherd, a great mystic, an exceptional communicator. His pontificate was guided in an extraordinary way by God through the events of history. God was particularly close to this Pope but not because God prefers this or that individual. The Holy Spirit has always watched over the Popes even when they were humanly not at the level of their task. In fact, there have been pontiffs in history that did not deserve this name; and yet, God acted even through them for the good of the people; not because He did not see certain behaviour, but to protect the faithful from suffering and scandal. This does not mean that God justifies the guilt of the bad shepherds: it means that God goes beyond the misery of men and acts beyond men. Were it not so, the Church would not have survived. However, since the Church is not man’s work, it survives man and his wickedness. Never confuse the structure of the Church made of men with the Church as the Body of Christ. They are two entirely different things. There have been particular Popes in history chosen and guided by God to be Shepherds not only of the Church but of the whole humanity; they were beams of light for everyone, believers or non-believers. John Paul II was one of them. As beloved child of Mary Most Holy to whom he had entrusted himself since his youth, he was able to combine strength and tenderness. His profound intelligence was linked to the special graces of his soul. He was faithful to God and a friend of humanity; however, he did not bend before the powerful, much less before the arrogant. And he proved it. The pontificate of John Paul II followed precise tracks: God’s mercy, the entrustment to Mary, the love for humanity. Some judged him as hard and conservative; he was just righteous and inflexible on the values that are the basis of human coexistence. His firm hand guided the Church and humanity towards a delicate and extremely important goal: the third millennium. From the first days of His pontificate John Paul II felt the urgency to consecrate Russia to the Mary Most Holy as requested by Our Lady of Fatima. As a child of the East he knew very closely the errors of Russia of which Mary Most Holy had spoken. He decided to proceed to the consecration without further delays, but he met a wall of opposition caused by the fear of provoking the Soviet regime and rendering the relationship of the Holy See with Russia even more difficult. These were the human reasons. However, the human reasons are only the reflection of what is occurring in the spiritual dimension: Lucifer and his Illuminati could not allow that Russia, such an importance player in their game, should be consecrated to Our Lady. Therefore, they opposed the Pope in every way especially through their colleagues who had infiltrated the Vatican. Men, unfortunately, do not fully understand the meaning of the consecration of a people to Our Lady. Yet, the demons and their cronies know it. When a people is consecrated to Mary, it is under her special protection. The Mother of God leads it to Her Son and intercedes with the Holy Trinity for its needs. She generates children of God within that people, protects it from Lucifer’s devastations preserving its integrity and keeping away the snares of evil. History is full of episodes in which entire populations were spared from wars or epidemics thanks to the intervention of Our Lady when invoked as Patroness. The more a people entrusts itself to Mary, the more it will be preserved from evil. This is one of the reasons why God has especially chosen the Croatian, the Italian and the Polish peoples: for their special devotion to Our Lady that has lasted throughout the centuries. Despite the fact that atheism is now spreading even among the Croatians, Italians and Polish, the faith of these three peoples is still alive and has maintained its strong Marian devotion that enables them to feed Europe’s faith. Nevertheless, the more a people is consecrated to Mary, the more it is targeted by Lucifer and his allies; this is evident in the case of the three mentioned countries which have experienced many trials; God has allowed them to strengthen their faith in God and the love for Mary Most Holy. In front of the determination of John Paul II to proceed to the consecration of Russia, Lucifer ran for cover. In fact, he knew that the Pope was not easy to discourage. So, the action of the most powerful mediums of the Earth and other planets began: evil spells of all kinds, black masses, satanic rituals and black magic against his person and his work; a real assault that would not end until his death. But the Mother of God covered with Her coat this very special child who had consecrated himself and his pontificate to Her. All the trials that God allowed did not bend this Pope, on the contrary, they made him stronger until he became a giant in faith. God spoke in a special way to his heart; he was a true mystic but he lived his experiences in secrecy; he concealed the secret of the king (Tob 12:7). Our Lady of Fatima had requested the solemn consecration of Russia bye the Pope along with all the bishops of the Earth. Many of them refused to do it for the most various reasons. The union between the Pope and the Bishops as a force within the Church broke down. This prevented the consecration from taking place according to the procedure that Mary Most Holy had indicated. That gave John Paul II great sorrow, and from that moment he offered himself in sacrifice of atonement for the great disobedience of many Bishops towards Our Lady, towards God and towards the Pope. After the Pope’s act of offering, the evil forces multiplied their attacks. Lucifer could not bear the presence of this disturbing Pope who, in the meantime, worked with all his power to help the people of East Europe to free themselves from the communist dictatorship. The anger of Lucifer and the Illuminati reached its peak. On 13 May, 1981, the day that recalls the apparitions of Fatima, an unprecedented event took place which made the whole world hold its breath: a killer shot John Paul II in St. Peter Square. The infernal forces hit the Church of the Earth in her core. The Pope was in danger of life. Since the official history has told you about this event abundantly, I will not dwell on the events of that day. However, God was watching over the Pope and did not allow that the allies of Lucifer accomplished their purpose to kill the Pontiff. The Christian people would have suffered a too great trauma by feeling abandoned. Our Lady’s prayer and that of the Saints and the humanities faithful to God prevented the worst. The Mother of God asked Her Son and received that the angels and the faithful brothers were present during the attack and acted each on their level. The bullet was miraculously diverted; the Pope suffered a lot but he remained alive. After this event John Paul II definitely reached the determination to consecrate Russia and to reveal the third secret of Fatima. He thought that the coincidence between the day of the attack and that of the apparitions of Fatima was not casual. He was clear that Our Lady had saved him not only for the sake of the Church, but because he had declared himself her beloved son from whom the Mother expected the fulfilment of Her wishes. Lucifer was furious more than ever: not only had the attack failed, but also he had achieved the only result that the Pope was even more motivated. The Illuminati and the allies of the Confederation of the Light were bewildered and had to undergo the rage of Lucifer who punished them severely. Lucifer does not act like God who forgives His children and understands their weaknesses. On the contrary, he is inflexible and vindictive and accepts no mistakes from those who have given themselves over to him. This is the reason why the kingdom of darkness advances faster on Earth than the kingdom of God: who makes a pact with Lucifer knows that in case of disobedience or failure he will be abandoned to his fate, or, even worse, killed or forced to commit suicide. This is how many of the consecrated to the devil end. God, however, never acts against the freedom of man and waits until he matures the decision to live according to the laws of the Spirit. While the children of Lucifer work non-stop under the threat of severe punishments, the Christians are asleep thinking that God will let them do endlessly, and always put off to the next day their decision for God. This is how the majority of the humanity of the Earth behaves: it gets busy only if forced by a master; left free it wanders around aimlessly and becomes passive. Under Lucifer’s pressure the Illuminati decided to speed up their programmes and to unleash the third world war as soon as possible before Russia was consecrated and the presence of life in the universe revealed. God, however, had other thoughts: thoughts of peace. So, on the day in which the Church remembers the Visitation of Mary, that is, the 31 May, St. Michael descended to hell on God’s order to announce Lucifer and all his court that God would have sent His Mother, the Queen of Peace, to Earth one more time. Nel Santo Padre, un gigante della nostra storia, noi vediamo la strada attraverso i tempi molto difficili che sono stati alla fine del secolo passato; vediamo la strada per il futuro, la strada dentro i nostri cuori, che atteggiamento prendere: “Io sono tutto tuo, e tutto ciò che è mio ti appartiene. Ti prendo per ogni mio bene. Dammi il tuo Cuore, o Maria”.In questi tempi la consacrazione a Maria deve assumere una profondità per portarci a una limpidezza, correttezza spirituale davanti a Dio, così che Dio possa operare dentro di noi con tutta la potenza. È stato detto tante volte: “Soltanto il Suo manto vi proteggerà”. Che cosa è il Suo manto? 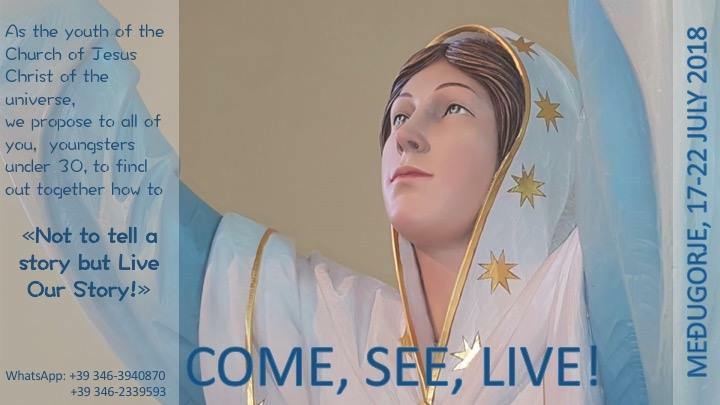 È una potenza dello Spirito immacolato che ci avvolge, dove Satana non può infiltrarsi; può provare ciascuno di noi in quanto Dio glielo permette, ma non può abbattere quanti sono consacrati sinceramente a Maria. In the Holy Father, a giant of history, we can recognise the way through the difficult times at the end of the last century. We can see the way towards the future, the way in our hearts and also what kind of attitude we should take: “I belong entirely to you, and all that I have is yours. I take you for my all. O Mary, give me your heart”. In these times the consecration to Mary must reach a certain profoundness which will lead us to purity and spiritual correctness before God so that God may act within us with all His power. It has been said many times: “Only Her coat will protect you.” What is Her coat? It is the power of the immaculate Spirit that envelopes you, a place where Satan cannot infiltrate; he can try every one of us as much as God allows it, but he cannot destroy the ones who are sincerely consecrated to Mary. The second point is that the Pope offered his life as a sacrifice for the reparation of the Church’s sins, for the Bishop’s lack of love towards Mary Most Holy and for the disobedience to the Pope; why to the Pope? Because he wanted to reveal the secret of Fatima; he wanted to consecrate the whole world, not only the Soviet Union, to Mary Most Holy. You can understand from the text how important this consecration would have been: a people who is consecrated to Mary, who lives consecrated to Mary, is particularly protected. So, the whole Church, the whole humanity of the Earth could have been protected by Mary. I have said that by looking at the Pope we can see the way that leads us through these times and what attitude we should take: to be consecrated to Mary, offered to Jesus through Mary Immaculate. The new people: those who feel called and inspired shall take this path. If you do not want to be passive and aimless in religion, even in the Christian religion -we wander in the Christian religion when we do not allow the Holy Spirit to guide us – and if you want to be giants of this time, it is important that a whole new people emerges: the beloved people of Mary Immaculate; it is important that a new people comes forth to defeat death, to defeat Lucifer and to defeat corruption. We will speak again about this Pope, however, keep looking at this path; look at it carefully and follow it; consecrate the Church continuously to Mary; consecrate your people, your family and your love to Mary continuously and sincerely; offer Mary everything: Totus Tuus. It is beautiful to see in John Paul II the figure of Isaac. When someone offers himself, it does not mean that he will suffer martyrdom, or that he will be destroyed. It means that he will be purified, lifted, transformed in a giant who will not fear anyone because he is fully submitted to Jesus Christ through Mary Most Holy. I bless you; may the light of the Holy Spirit enlighten you and your existence, your relationship to God, your mutual relationships. May the Church on Earth be enlightened; may all the events occurring on Earth become clear in front of your eyes. Much stronger events will pass in front of your eyes; may you be ready to face them with holiness and with God’s strength; in the name of the Father, of the Son and of the Holy Spirit.